Here’s a Quick Planner Tip for my planner friends out there who love to decorate their weekly and monthly spreads. I love getting cute weekend banner stickers on Etsy, but I also like to switch things up by making my own with various materials, like washi tape. 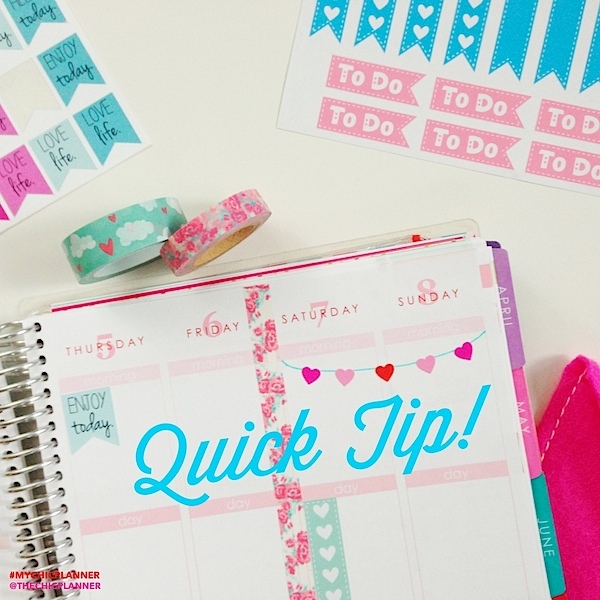 Simply draw a curved line across the weekend days of your planner as pictured above. Evenly spread small stickers of choice across the line. I used tiny hearts from a sticker book I picked up at Target. Naturally, you could use any small sticker, like circles, stars, etc. To make the spacing pretty even, I placed the center heart first and spread the others out from there. I just added five stickers to be decorative, but I could have added enough to spell out “weekend”. Of course, you can spell out any word of choice or make a non-weekend banner, too. You could do one for a special event, holiday, etc. Use a fine-tip permanent marker to write a letter on each sticker or place a letter sticker on top of your shape sticker. Have fun making your DIY Weekend Banner with Stickers. The possibilities are truly endless!